UTFCast Professional is a tool that lets you batch convert all text files to UTF encoding including UTF-8, UTF-16 and UTF-32 with just a click of your mouse. You can use it to convert a directory full of text files to an output directory, while maintaining the directory structure of the original files. It doesn't even matter if your text file has a different extension - It can automatically detect text files and convert them, and also has the ability to recognize over 30 codepages. 1.Super high speed. 100,000 files, sized about 65GB, it only takes UTFCast Professional about 200 seconds for detection on a mid-end computer. And a file sized about 290MB only takes it 7 seconds for conversion. This means in one second, it detects 400-500 files or converts over 40MB of your files. 2.Multi-Core support. Multi-Core is leveraged to maximize detection and conversion. The only bottleneck is your hard disk drive. 3.Automatical text file detection. No matter what the file's extension is, UTFCast Professional will always check whether the file is a text file. 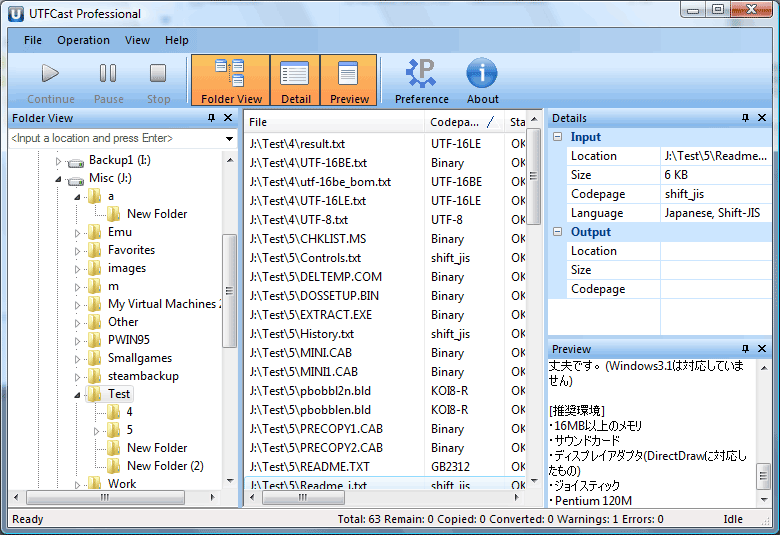 Just select a folder, your text files will be automatically picked up for conversion. 4.Detect and convert 30+ codepages. Codepages does not need to be specified manually, UTFCast Professional can recognize 30+ codepages, such that correct codepage will be automatically applied to every text file. 5.Unlimited file size handling. Convert a text file that larger than 1GB, or even 1TB? UTFCast Professional can handle this! 6.Easy to use. Click on a menu item only ONCE, UTFCast Professional will convert every text file in the folder, output conversion results to another folder, and keep your folder structure intact. Nothing could be simpler than this! System requirements: Windows XP SP3 or later version. New features such as codepage statistic and filtering, export to CSV, copy to clipboard and general bug fixes. Search and replace utility with Unicode/UTF-8 support. Extensive regular expressions with extended syntax. Preview each replacement. Windows scripting, command line parameters. Update all of your files at once, locally or on FTP. Tabbed User Interface for Microsoft Word 2010 64-bit - Document Tabs for Word x64 gives you the ability to open, read, edit and manage multiple documents in a tabbed window. You can easily switch documents as the way in IE 8, Firefox and Chrome. PowerPoint/PPT to Image Jpg/Jpeg Bmp Tiff Png Converter can create image format from documents including powerpoint(.ppt, .pptx, .pptm).It can convert different file formats to image format in batches once.